Signed, lined and dated by the author. Exclusive edition with additional short story not available in the standard editio. 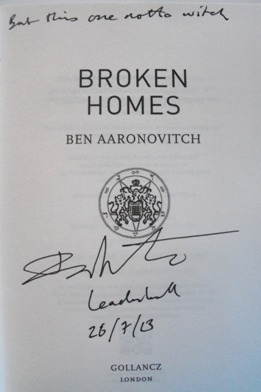 Synopsis : Ben Aaronovitch has stormed the bestseller list with his superb London crime series. A unique blend of police procedural, loving detail about the greatest character of all, London, and a dash of the supernatural. A mutilated body in Crawley. Another killer on the loose. The prime suspect is one Robert Weil; an associate of the twisted magician known as the Faceless Man? Or just a common or garden serial killer? Before PC Peter Grant can get his head round the case a town planner going under a tube train and a stolen grimoire are adding to his case-load. So far so London. But then Peter gets word of something very odd happening in Elephant and Castle, on an housing estate designed by a nutter, built by charlatans and inhabited by the truly desperate. Is there a connection? And if there is, why oh why did it have to be South of the River? Full of warmth, sly humour and a rich cornucopia of things you never knew about London, Aaronovitch's series has swiftly added Grant's magical London to Rebus' Edinburgh and Morse's Oxford as a destination of choice for those who love their crime with something a little extra.